The US Congress has officially released the secretive 28 pages of a 9/11 investigation that allegedly involve Saudi Arabia's role in the terrorist attack. The pages have been made public by the House Intelligence Committee after intense pressure from the families of 9/11 victims and Congressional lawmakers. "Releasing the contents of the 28 pages will answer some of the many questions that remain," said Democratic Representative Stephen Lynch, one of the most vocal advocates for the pages' release. "It may help us at least hold those who are responsible accountable." The first of the 28 pages. The findings of the report claim that some of the 9/11 hijackers could have been in contact with Saudi officials and intelligence officers. Moreover, they supposedly received assistance from those officials. "The Joint Inquiry's review confirmed that the Intelligence Community also has information, much of which has yet to be independently verified, indicating that individuals associated with the Saudi Government in the United States may have other ties to al-Qa'ida and other terrorist groups," the findings read. One portion of the documents suggests that there was a 9/11 "dry run" in 1999. "According to an FBI agent in Phoenix, the FBI suspects Mohammed al-Qudhaeein of being [redacted]. Al-Qudhaeein was involved in a 1999 incident aboard an America West flight, which the FBI's Phoenix office now suspects may have been a 'dry run' to test airline security." The documents details alleged connections between the hijackers and the Saudi government uncovered by the FBI and CIA. Memos suggest that one Saudi national living the US, Osama Bassnan, "might be a Saudi intelligence officer," and "reportedly received funding and possibly a fake passport from the Saudi Ambassador to the United States and his wife." Bassnan bragged to an FBI informant in the Saudi community that he actively helped the hijackers. "A CIA report also indicates that Bassnan traveled to Houston in 2002 and met with an individual who was [redacted]. The report states that during that trip a member of the Saudi Royal Family provided Bassnan with a significant amount of cash." Another individual, Abdullah Bin Laden, worked for the Saudi Embassy in Washington DC, and "is identified by the FBI as Usama Bin Ladin's half brother." The findings also suggest that both the FBI and CIA failed to adequately investigate Saudi connections until implored to do so by Congress. "Only recently, and at least in part due to the Joint Inquiry's focus on this issue, did the FBI and CIA establish a working group to address the Saudi issue. In the view of the Joint Inquiry, this gap in US intelligence coverage is unacceptable, given the magnitude and immediacy of the potential risk to US national security." 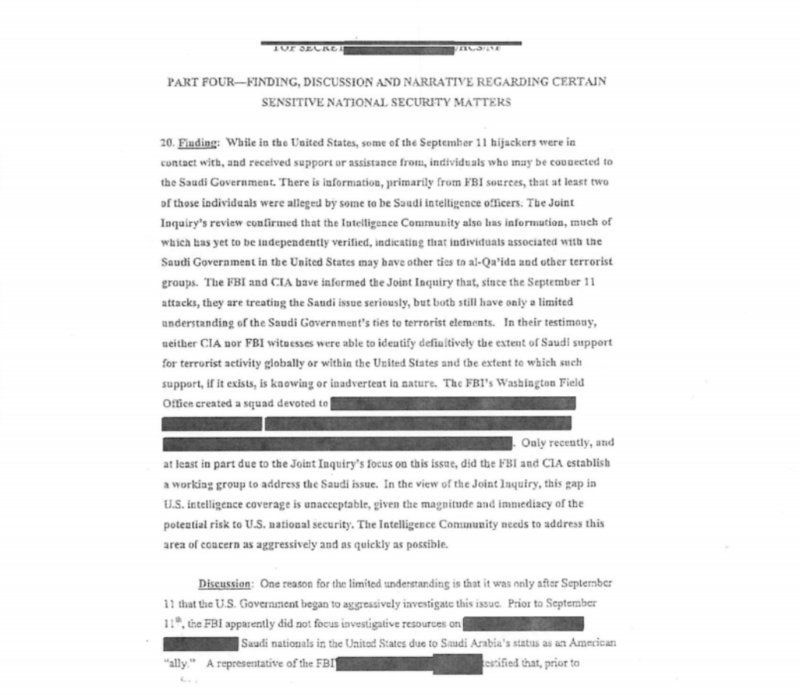 The 28 pages were originally classified by former President George W. Bush on the grounds of protecting intelligence sources.